By DocFletchLXG, March 20 in What's In Your Bag? Hello all! 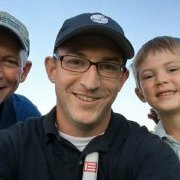 This is my first forum post here on MyGolfSpy. I live in the Northern Shenandoah Valley and try to play 1-2 times a week. I would say my handicap is about a 10? In my last 20 rounds i have 2 75's but also a 89 and a 91. Anyways here is my bag for 2019. 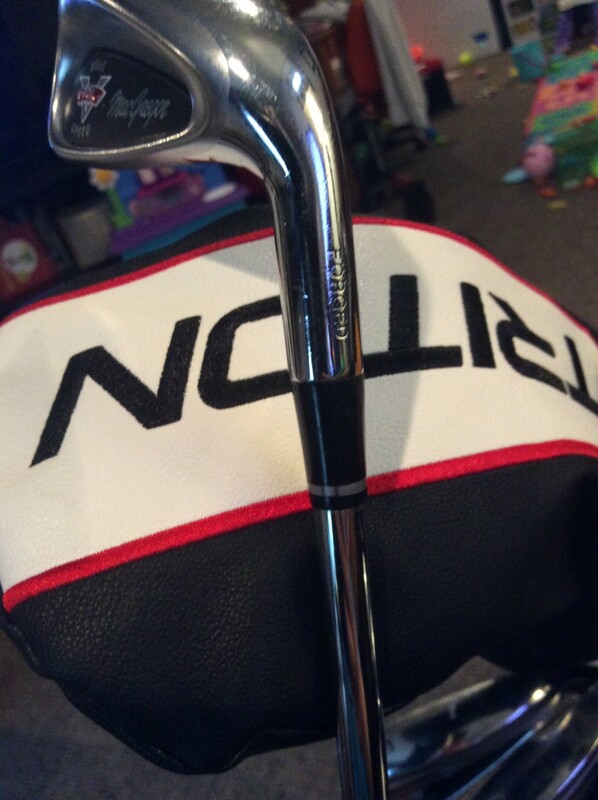 Putter- Odyssey 2-ball OG from 2004? Anyways guys I'm excited to be a part of the site I will add some photos soon! Cheers! Hit it hard! Welcome to the forum! Curious to see a Triton in the bag. How do you like it? Welcome and thanks for posting. Please include some pictures when you get a chance. I like to see the goods. 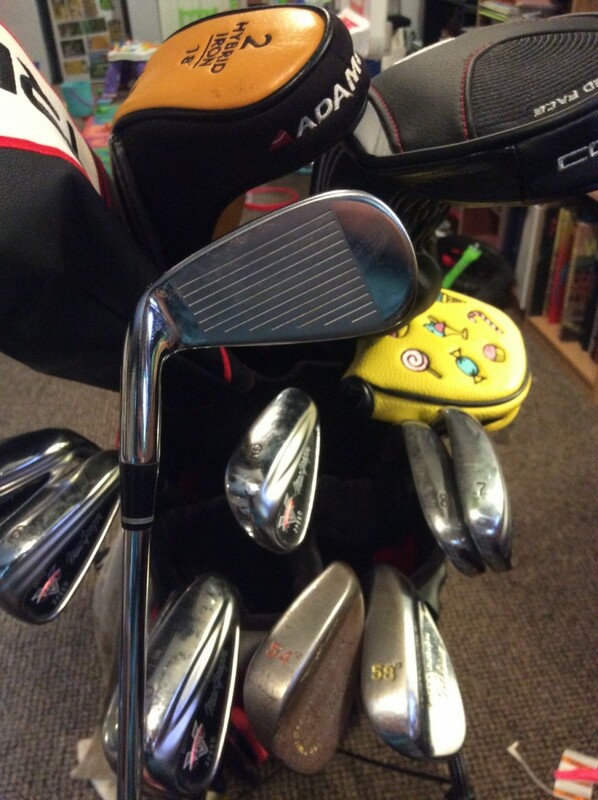 These are my irons and wedges. I run the 4-GW Macgregor M565. I took the 3 out of the bag as it is 20* and my Hybrid is 18*. I felt carrying both was redundant. The shafts are rifled "Precision" S 5.5. The Gap Wedge (50*) I DUMBLY pulled the emblem off the back like a fool but that grip is a Golf Pride MCC in Black and White. Seriously pulling the emblem off that gap wedge was the worst decision I have made with golf equipment ever. 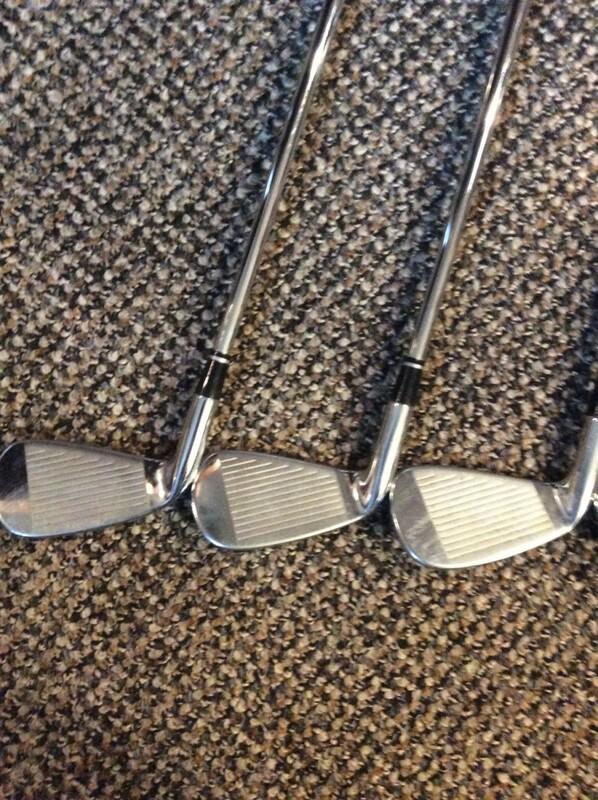 The Irons are "Forged" but still have a pretty wide sole and low weighting for I guess "mid level" players. (perfect for me). They still have the responsiveness of a forged iron but still very forgiving. I plan on playing them until the grooves do not exist anymore. Whenever I do upgrade I will probably look at the new Wilson D7 Irons but I HATE how aggressively loft all irons are now. They claim to offer "more distance" but a 7 iron is the loft of my old 5 iron. 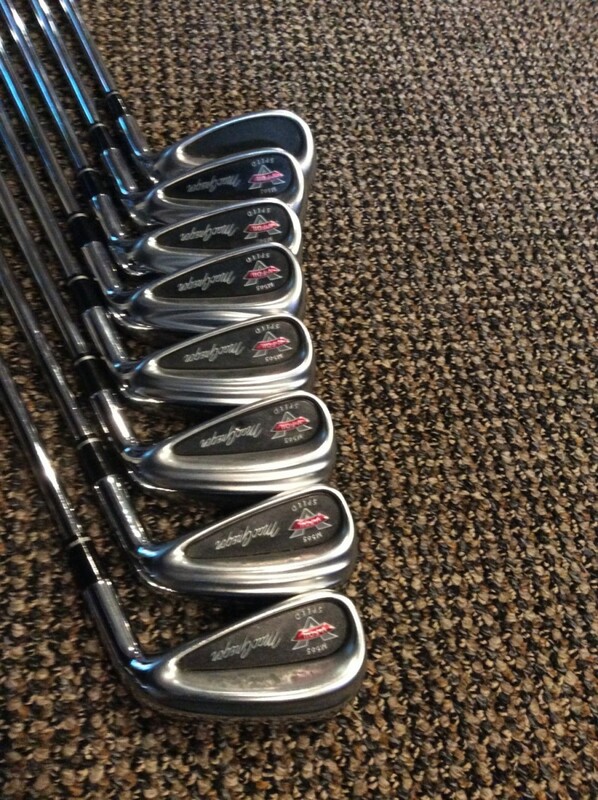 But I digress, I love these Macgregor M565 Irons and will play them forever. 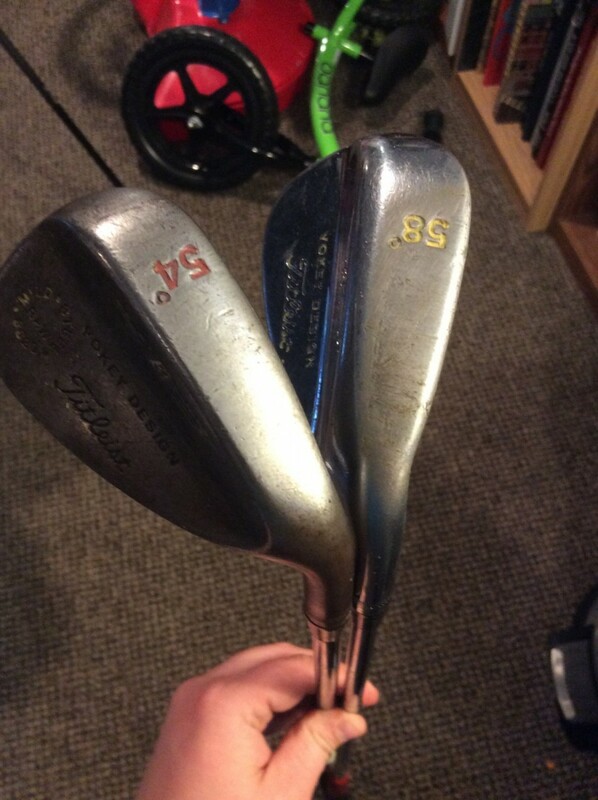 Wedges 54, 58 both Titleist Vokeys I believe the 1997 release? Not sure. 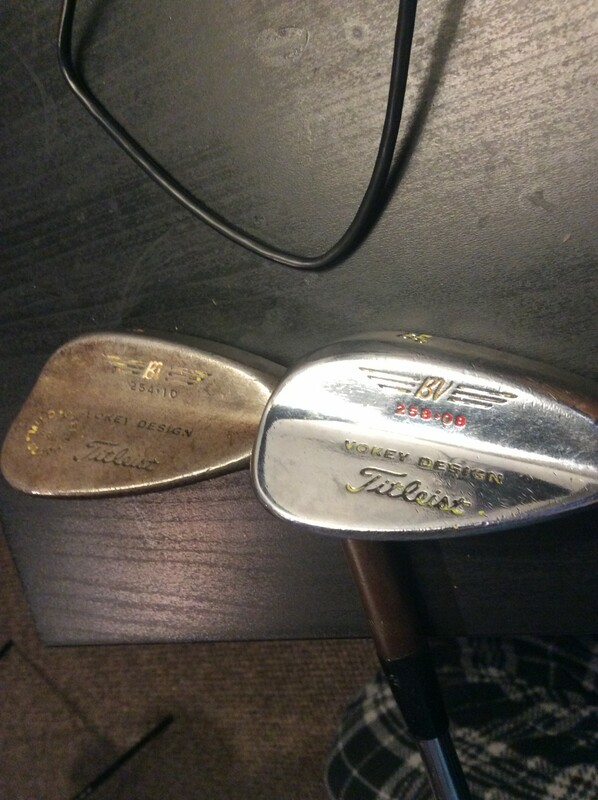 Either way both were a gift from my fathers college roommate who was a pro in Kansas for a long time. They were used when I got them but I was I think 12 or 13, around 2002. They both feel really great and the 58* has a bounce of 8* which (I THINK) allows me to open the face more and allow me to play a variety of shots. The 54* is my 50 yards and in ":chipper" and I use the 58* in tight spots only. I'm real apprehensive to pull the 58* unless I have to. I have also used a "Tru Groove" sharpener on both the 54 and 58 wedge (don't tell anyone) to try and prolong the life of the wedges. 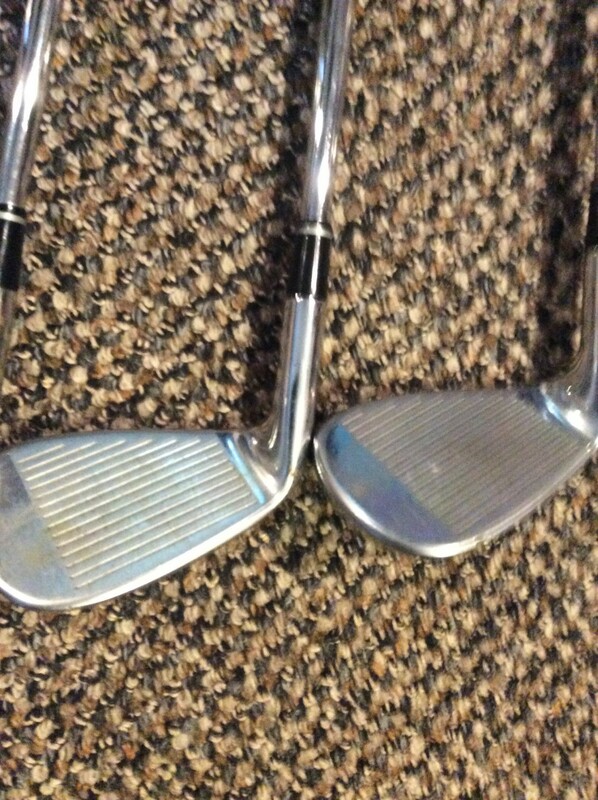 I'm on a budget and dropped 300 bucks on a 3 wood so minimum 200 bucks for 2 new wedges isn't going to happen. Honestly tho I do not see any difference after using the groove sharpener extensively. I supposed maybe a little bit but I think we would need a launch monitor on course to really know the truth. Hello! Thanks for the reply! I really do like my Triton Driver. I purchased it last fall (November 2018) still new in packaging on Ebay for 99 dollar including shipping. 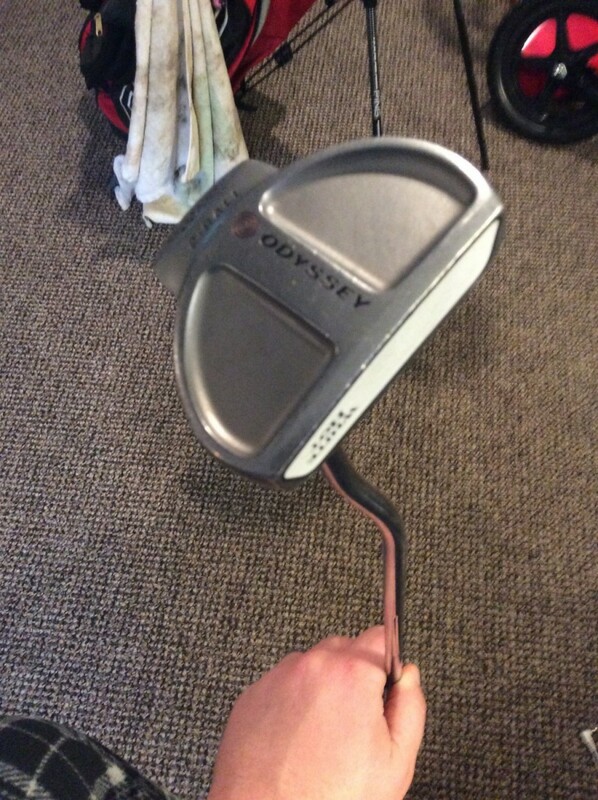 My previous Gamer which I'm still thinking of going back to is a 43" TaylorMade Burner TP from 2006. I had it shortened slightly years ago and love it. I am 6'4" and this Triton is longer I'm thinking around 45". Back to the Triton. I also have the 12 gram weight which Wilson actually removed from circulation after the dust up with the whole "USGA Non-conforming" thing. But I do not have the "illegal" set up as I use the Carbon Fiber soleplate with a 6G in the toe 2G in the heel and the 12G in the back. I also jack the loft up from 9* to 10*. I do not like how the driver does look slightly closed at address but that's something I can get past. 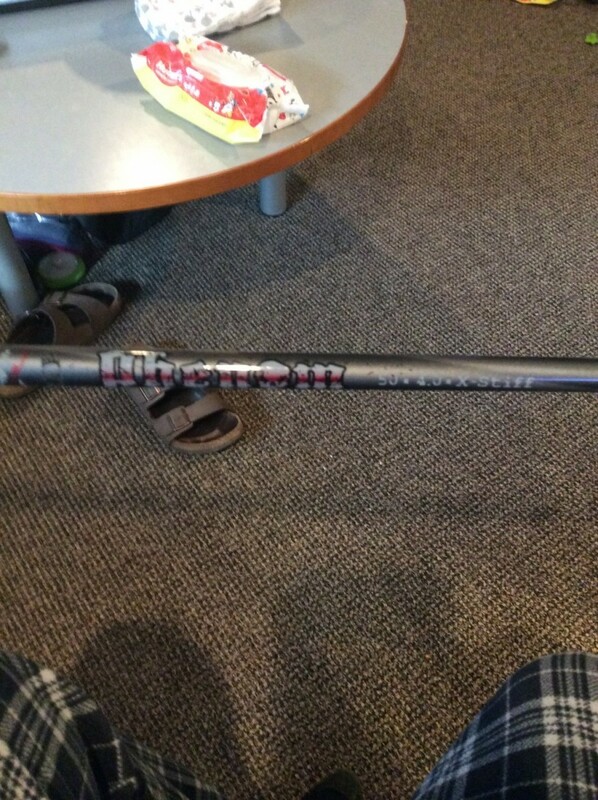 The shaft is the Aldila RIP Phenom (Grey Paint One Red Eye) in Xtra Stiff 50Grams 4.0 Torque. I kind of like the shaft but I honestly prefer a stiff flex. a little heavier shafted stiff flex is what I like feel wise. 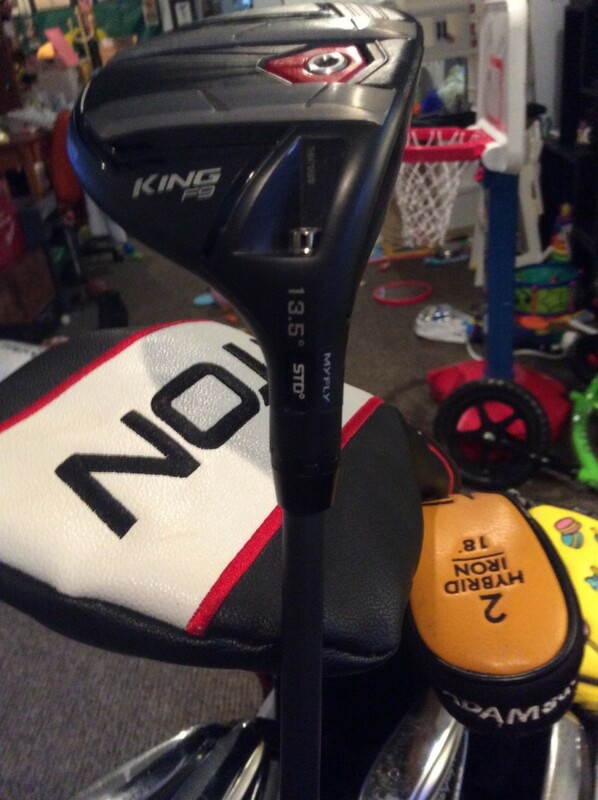 The shaft in my 3 wood is what I REALLY want to put into this driver. I run the 4-GW Macgregor M565﻿. I took the 3 out of the bag as it is 20* and my Hybrid is 18*. I felt carrying both was redundant. 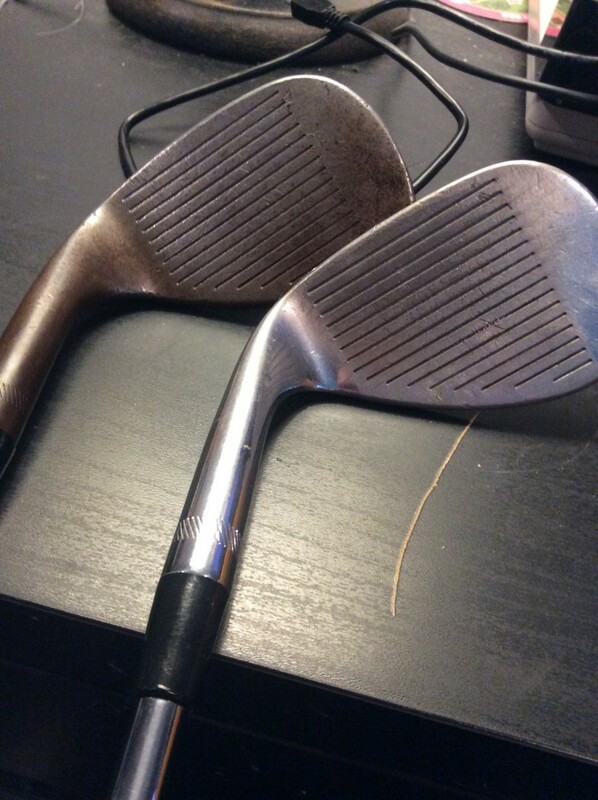 Gentlemen, we might need to start a thread: "what's the Most Interesting WITB on the forum?" I have to think that this is a contender. Also, if "pulling the emblem off that gap wedge was the worst decision [you] have made with golf equipment ever," you are light years ahead of the rest of us! 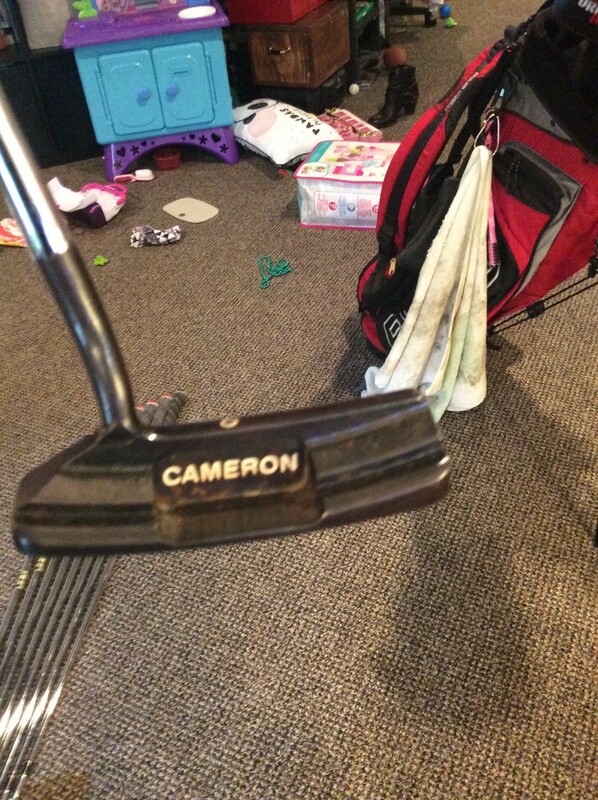 Great WITB, and welcome to the forums! I posted about my driver as well above. So I'm not going to cover that again. I'm really most excited about my new 3wood it is the new Cobra f9 tour. 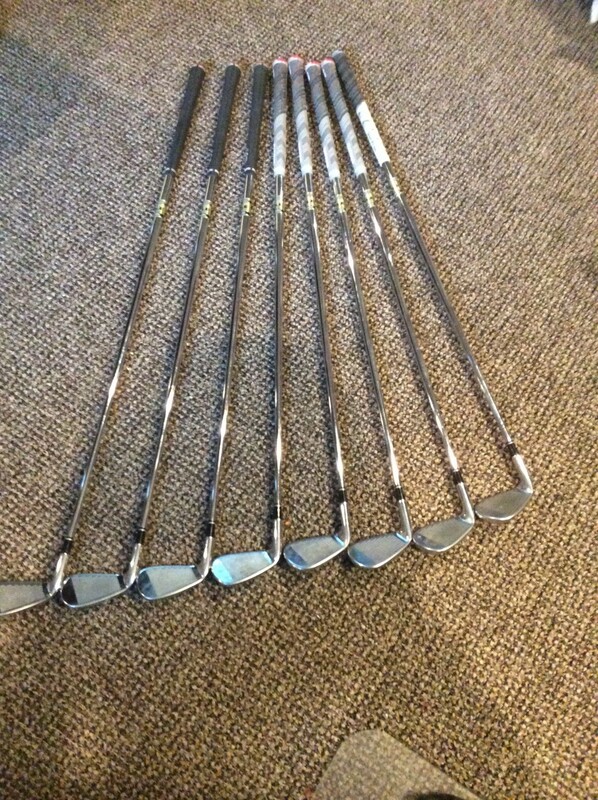 I tried all the major 3 wood at Golf Galaxy and they all looked MASSIVE to me. Like aesthetically to much. But the fitter brought over the "tour" model of the F9 speedback and it love at first sight. I was a big upgrade from my Nike Sasquatch. 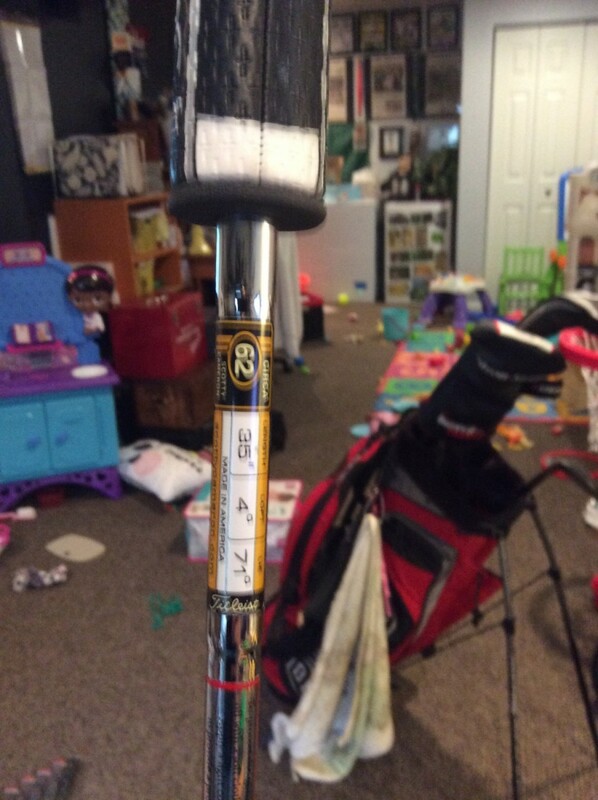 The shaft in the 13.5* 3wood is a Project X Smoke Black 70G Stiff Flex. I think it's really the star of the show and am looking into getting a Wilson adapter on one to throw it into my Triton. 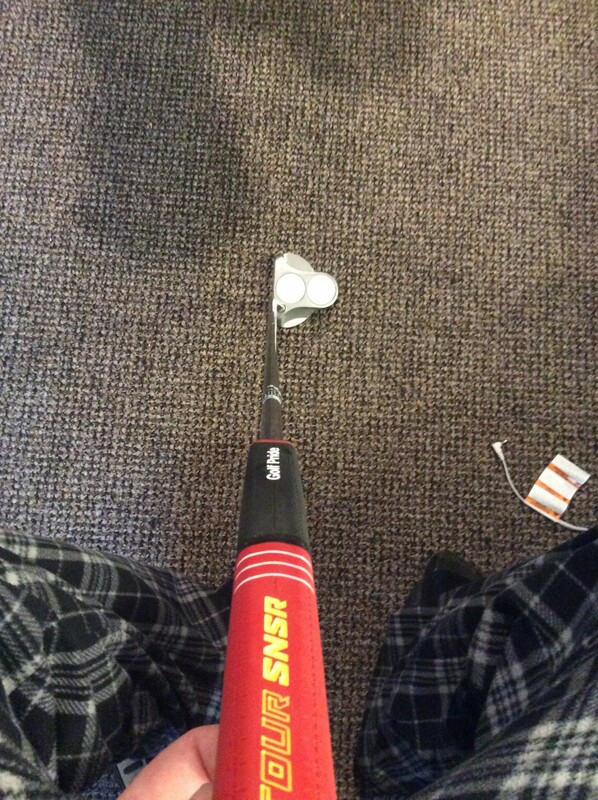 The shaft is perfect for me and my swing. 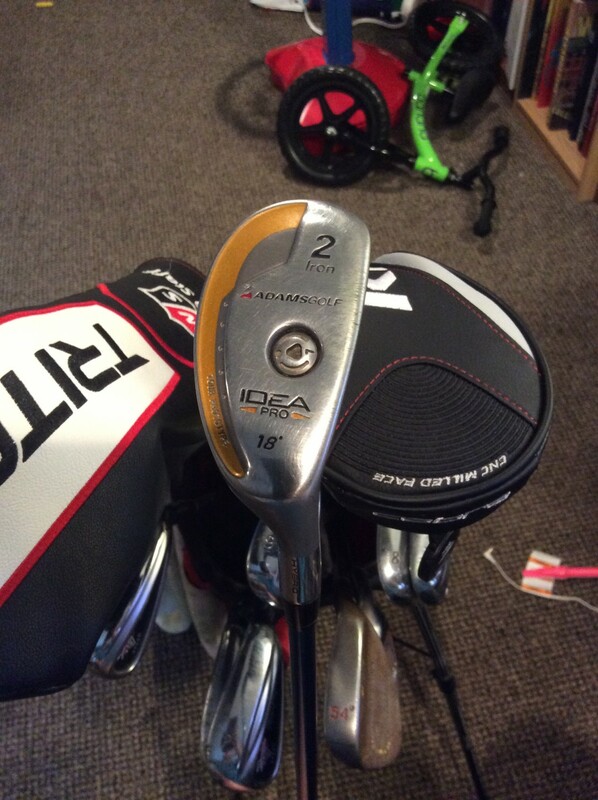 2 Iron Hybrid- Adams Idea Pro, Circa 2007-2008 with a Stiff Flex 80G Aldila "By-you" shaft. So the story behind this club is when I was in college I had a job in a pro shop (shout out Fiddlers Green Eugene OR). Adams would hook up the salesman at pro shops for pushing Adams gear to customers. Well after a summer of selling clubs the Adams business rep came and said I could have any Driver/3wood/Hybrid that I wanted in their line. Well I did not have a hybrid at the time so I chose that. I got to choose this club FOR FREE just as a thank you for selling their gear. Truly Adams was amazing back in the day. 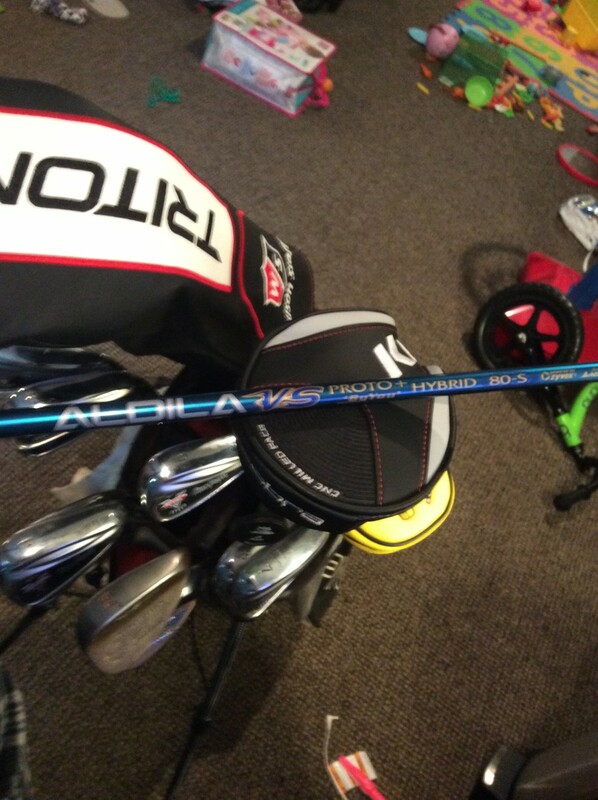 But on the course the hybrid is everything you want it to be. Sits slightly open at address and has a beautiful click sound on impact. This club is great for those 220 carries over water. Hey man I'm touched. 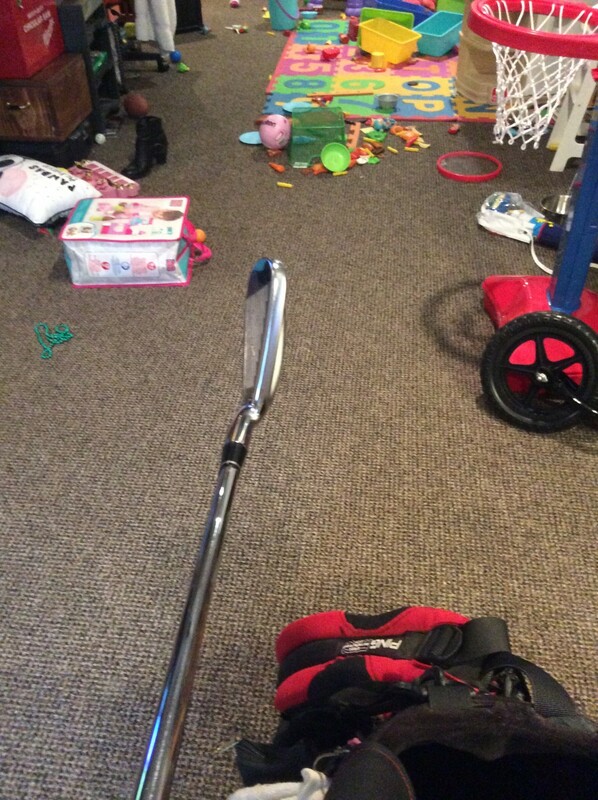 My golf clubs are an extension of me. Like a surgeons tools. 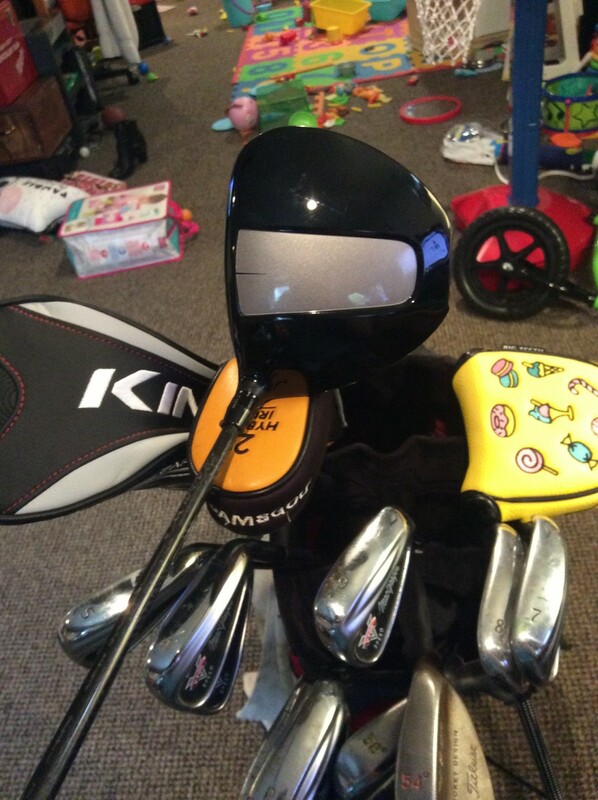 Taking me from being a poor high school golfer, to an even poorer DIII college golfer, and finally turning into a (maybe 10-12) handicap player who only gets out once a week because of wife and 2 small children. Cheers mate. Love the site. If you guys are ever up near the Northern Virginia metro area lets hit the sticks. I’m really digging this setup. Those MacGregors are some of the most underrated irons made. Play well, thanks for sharing! I remember when those irons came out, 2003 perhaps? Anyway, only one place locally carried Macgregor and I remember demoing and loving them. If I recall correctly they had very little offset, but like you said, with the weight down low, the ball flew high. Actually too high for me. I ended up keeping the Mac PCB’s in my bag instead but I regret not buying them. Nice to hear you found the set that is perfect for you. 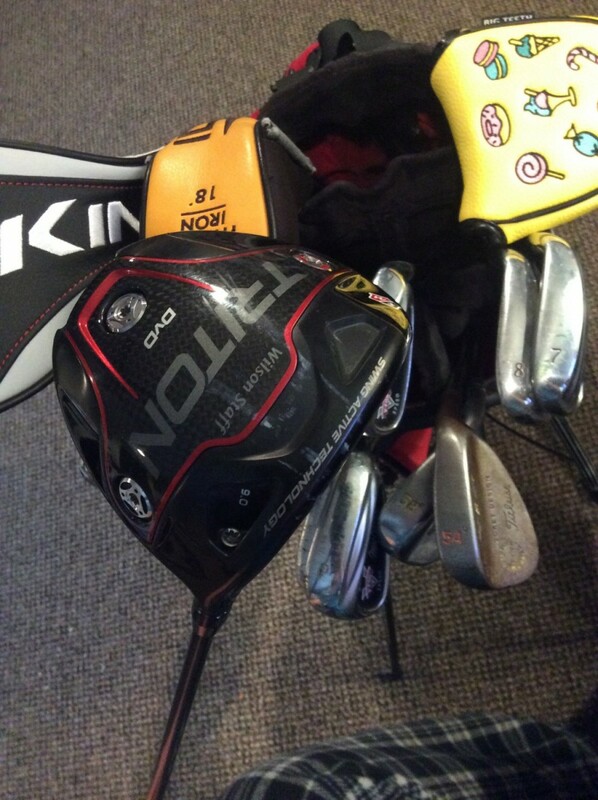 Welcome aboard, @DocFletchLXG - nice intro and detailed pics of WITB! 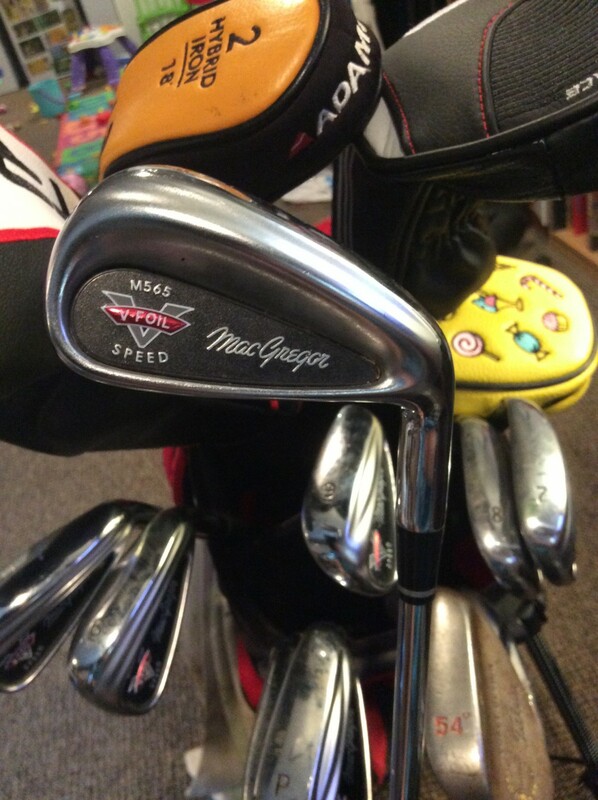 I have the same set of MacGregor M565s in one of my guest bags. I remember hitting those when they came out, and I LOVED them. VFoils have been some of the best clubs MacGregor made, even in the VIP run of VFoils. 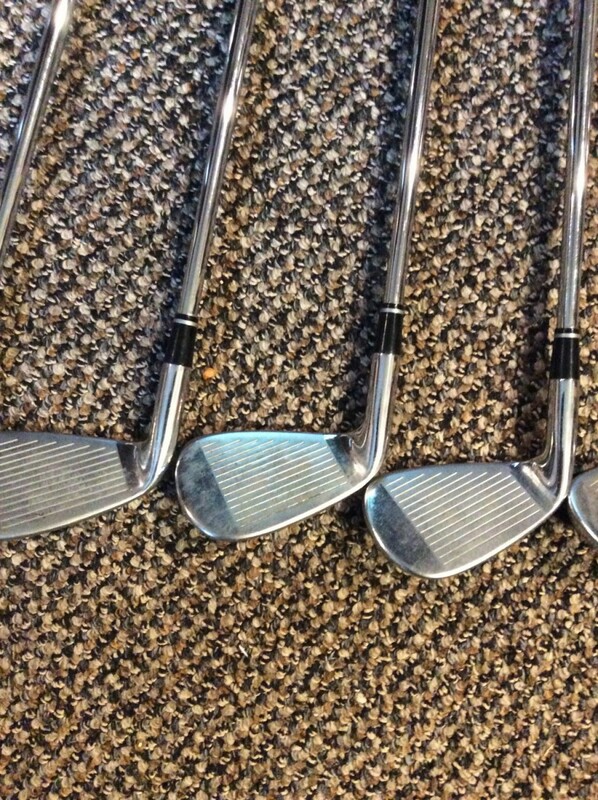 Great irons. @DocFletchLXG, thanks for adding pics, it totally added a different dimension than just the list - that is a great mix of equipment! Hey guys I have an update to the bag. 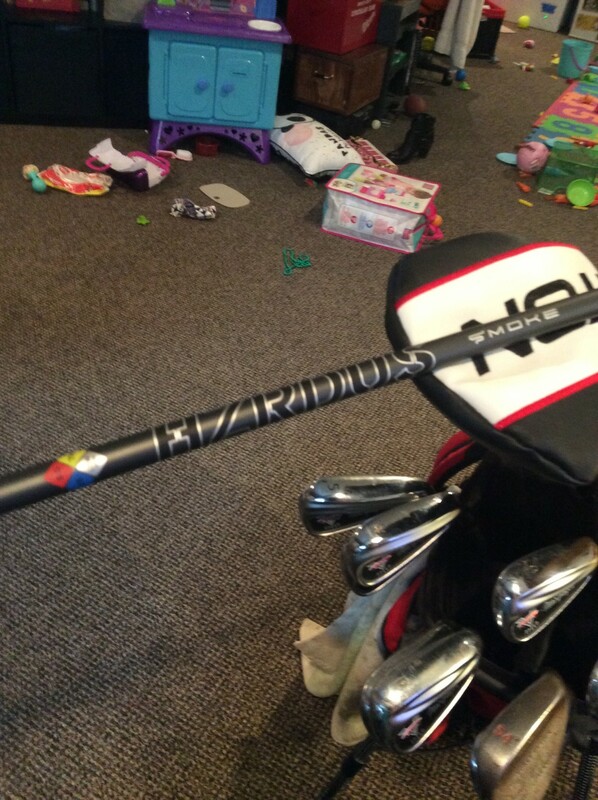 Nothing crazy but I JUST ordered the Project X HZRDUS Smoke Black 70g stiff flex shaft for my driver. In the couple weeks since making this post I have really struggled with my driver consistency and i truly do not like the feel of the extra stiff shaft. Welcome to the forum and that is a great bag of tools you got there. As far as the shaft goes and cutting it to the same length as the 3 wood, what are you trying to accomplish? Making it a lower lofted, bigger head 3 wood? Trying to achieve the same feeling? 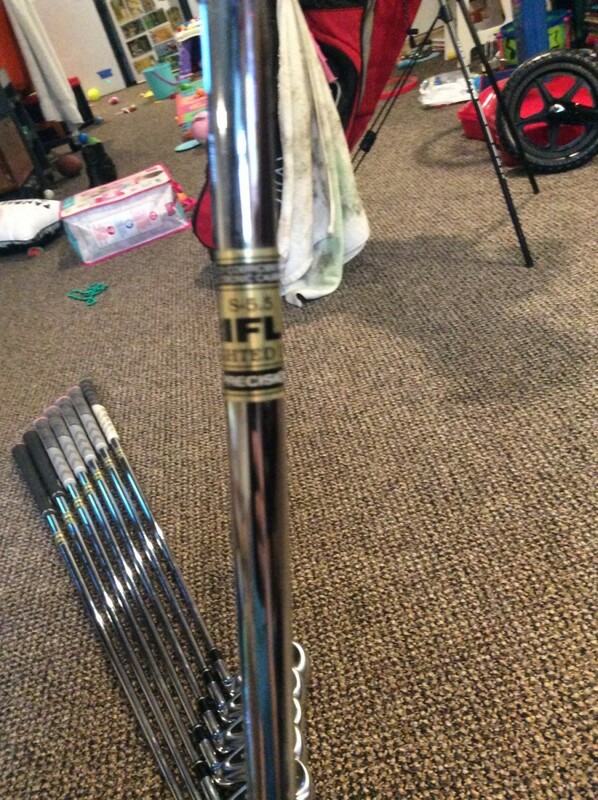 If you cut the shaft down to 43" and tip it without adding weight back to the head it will play stiffer the 3 wood shaft. thank you for asking! My reasoning with cutting the driver down 2 inches is for some more control. My current shaft is an X stiff 45" and I'm just not as accurate as i would like to be. 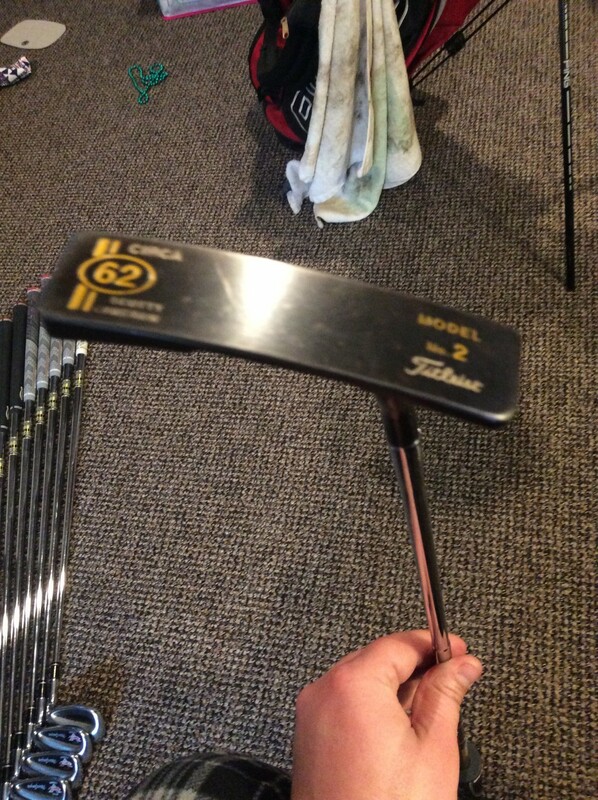 (my previous gamer is a taylormade burner tp 2006) and I had that cut to 43.5" back in 08. But I'm pretty much thinking off of tipping the shaft at all and just cutting all the length i want to off the tail end of the shaft. My swing speed is certainly in the X range but I just dont like the feel of swinging a telephone pole i think? I completely understand the reasoning behind playing a shorter driver for control. I play all my drivers short, currently 44.25" with my st190. I always add weight back to the head to get at least some off the swing weight back. I need to feel where the head is during my swing. Every 1/2" of length decreases the SW by 3 points. So if you cut 2" off your driver and don't add any weight back you will be 12 SW points lower. I am not trying to talk you out of it as I believe OEM'S are making drivers too long to begin with. Just want you to know that if after cutting it down it may feel a lot different. If it does, add weight to the head until it starts to feel like normal.